In Ferguson And Across The Country, Protests Are More Subdued : The Two-Way Only about 30 demonstrators were out Wednesday night in Ferguson, NPR's Elise Hu reports, and there were only a handful of sizable protests across the country. 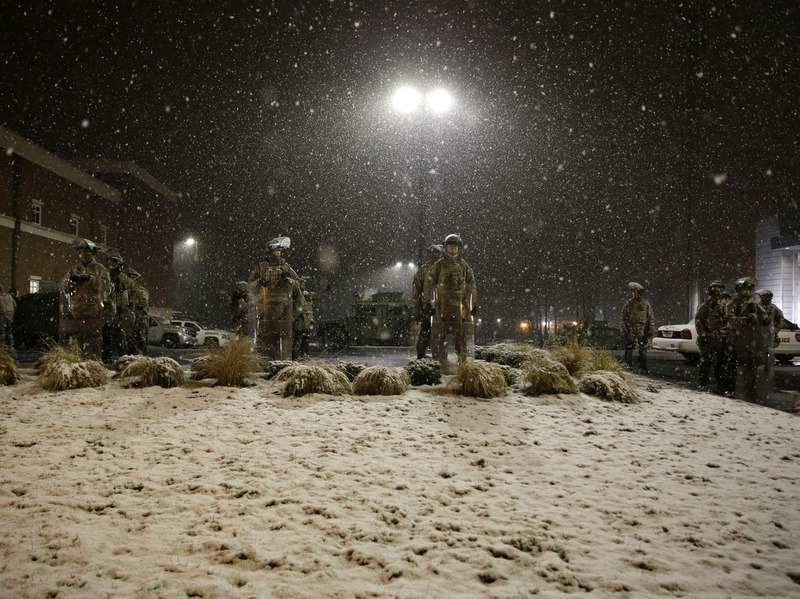 Snow falls Wednesday night as Missouri National Guard members stand outside of the Ferguson Police Department in Ferguson, Mo. Protests of Mondays grand jury decision were dampened somewhat on Wednesday night — particularly in Ferguson, Mo., where only a few dozen protesters braved the snow to demonstrate. NPR's Elise Hu says things were fairly subdued there. "We're estimating about 30 demonstrators are out tonight, tops, which means they are outnumbered by National Guard troops that are manning the front of the police department. Most of them are protesting quietly. 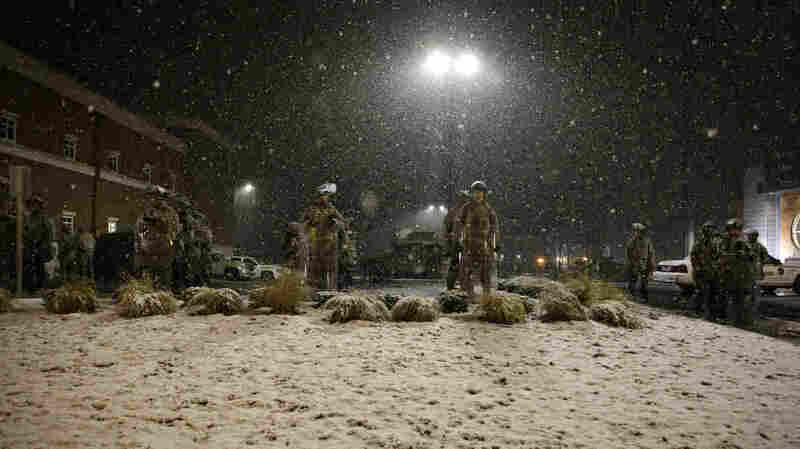 There's few folks who are yelling some things at the National Guard, but ... the main road here in front of the police department has remained open, which has been different than previous evenings." More robust protests were seen in London, at the U.S. Embassy, and in Los Angeles, where protesters attempted to march on the Staples Center — where an NBA game was in progress — before being turned back by authorities, the city's CBS affiliate reports. A number of protesters were arrested, and will have to either pony up $500 for bond or spend the holiday in jail. Smaller protests also were reported in Denver, and in Oakland, Calif., which was the scene of large, contentious protests the previous two nights. Ten fans also marched through Atlanta's Phillips Arena during a game between the Hawks and the Toronto Raptors before leaving the arena peacefully, The Associated Press reports. St. Louis Public Radio says: "Protesters organized an array of small gatherings throughout the St. Louis area Wednesday night, including a procession of cars in the Shaw neighborhood, a gathering at the Galleria Mall and a brief vigil at the Michael Brown memorial in Canfield Green. A small group congregated outside the Ferguson Police Department as it grew dark, including many media personnel."